Like your body language says as much as your words in a conversation, your riding language —where you ride on the road—tells others what you’re doing. Simon Vincett suggests strategies for communicating to the traffic. Whether you are blessed with bountiful bike lanes or you have to mix it with the traffic for all your riding, there are always times when you have to be very deliberate about where you position yourself on the road. Hugging the gutter in certain situations can invite drivers to try to pass you when there isn’t actually enough room. A far better option is for riders to merge into traffic until they’re past the squeeze point, then moving back left to let other traffic pass. In the lead up to most intersections, for instance, bike lanes tend to run out, requiring riders to merge with standard traffic lanes. If it’s not a roundabout and you’re continuing straight ahead, sticking to the left is fine. However, if there’s a left turn slip lane, for example, you will do well to head check, signal and move out a little to minimise the chance of a driver cutting you off as you continue ahead and they slip left. In such a situation, signalling where you’re going will not only help yourself but other road users too. Clear intentions make traffic more predictable and less stressful for everyone. You may feel intimidated at the thought of moving further out into a lane of traffic. Your confidence to do so will depend on how fast you ride and how fast the traffic is—it’s certainly more scary when you are much slower than the other traffic. You should remember that you have the option to pull over and walk the bike through situations where you feel uncomfortable. Good will on the roads is precious currency, so do your bit to bank some. The flip side of being aware of your road positioning is being mindful not to hog the road. Cyclists can ride two abreast—and it’s a lovely thing to enjoy a sociable ride—but the road rules require you to keep to a maximum of 1.5m apart so as not to take up the whole road. Of course, there’ll be times when the sharing caring thing to do is actually to ride single file to allow other road users to pass. Similarly, an individual riding way out from the side of the road, as well as exposing themselves to risk from faster traffic, might be preventing motor vehicle drivers from passing. Let’s look at some specific scenarios where the road system helps you and times when you have to help yourself. A helpful road marking that is popping up more and more at signalised intersections around Australia is the bike box. They are spaces marked for bikes in front of stop lines and before the pedestrian crossing lines. The idea is to position riders in clear view so drivers notice them, and will be looking out for them further up the road. Unlike a bike lane, the bike box stretches across the width of the standard traffic lane. This is to fit the maximum number of bikes in. Riders are expected to move across to the left to ride in the bike lane when through the intersection. Bike boxes can be accessed by the bike lane or the kerb-side lane, to the left of traffic. Lane filtering between two lanes of stalled motor vehicle traffic is not allowed for cyclists. Lane filtering is allowed for motorcyclists in QLD, NSW, VIC, the ACT and to some extent in WA but motorcyclists are not allowed to stop in bike boxes. Sharrows are another type of road marking that guide bikes to take a particular road position. These occur in locations such as the lead-up to roundabouts or where the road narrows such that a motor vehicle and a bike rider don’t have sufficient space to travel side by side. In this case, check behind you, indicate and, when clear, move into the standard traffic lane. Some roads are just too narrow for a motor vehicle to safely pass a bike. Many bridges, for instance, don’t have an ample shoulder. These situations require you to merge into the standard traffic lane. The narrower the road, the more imperative it is that you assertively merge into traffic, requiring any passing manoeuvre to involve the following vehicle to move across into the oncoming traffic lane. Vehicles are required to pass only when they have a clear view of coming traffic, and when they can pass safely. If you’re not confident mixing with traffic, it’s a good idea to pull over and walk your bike through this section. ‘Dooring’—when a motor vehicle driver or passenger opens their door into the path of a rider—is the third most common crash type for riders in Victoria. The door zone is the name given to the space taken up by the width of an open vehicle door. Riding outside the door zone is, therefore, an essential type of road positioning to manage your risk when passing parked cars. Note that marked bike lanes are often partially within the door zone and sometimes vehicles park so that the reach of their door extends across the whole of the bike lane. You should always ride wide of the door zone, which means you may ride on the outer edge of the bike lane if need be and outside the bike lane if necessary. Before moving out of the bike lane, look behind you, indicate and move into the standard traffic lane when it’s clear. This is the classic situation of road markings leaving bike riders with no support. You’ll need to merge into the standard lane beside you. Usually the bike lane disappears in the lead up to an intersection as the lanes begin to split into a turning and straight ahead lane. It’s time to gauge the traffic around you with a head check, signal and, when the way is clear, move into the lane you need. For more, see our previous articles discussing road positioning in detail for roundabouts and right hand turns. 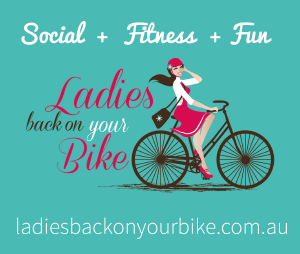 This entry was posted in Blog, Latest, Riding know how, Road rules, Trending and tagged communication, confidence, cycling on road, intersections, road cycling, road rules, roundabouts, take the lane. Bookmark the permalink. Glad I wasn’t the only one that was a little confused by those symbols. Please RideOn, to make this article helpful to us all, can someone please explain what the symbols mean ? Thanks for asking. The first symbol signifies looking to check the way is clear to change lanes. The second symbol signifies signalling the intention to move. We’ll provide explanation of symbols in future. That “sharrows” diagram is a recipe for disaster – as drivers approach the roundabout, the cyclist is in a separate lane, and therefore discounted by the driver as a hazard to be considered. Then, just as the driver arrives at the intersection, having already discounted the cyclist as a hazard, and while they are concentrating on other vehicles in the roundabout, the cyclist now suddenly moves into the driver’s lane. If a cyclist is going to move into the vehicle lane on the approach to an intersection, they should do it well before the intersection (not immediately before) to make their intentions clear. This is a helpful article. I agree with Tim above the Sharrow sign. I also think cyclists should be able to filter between lanes are there is sometimes no other option (except sitting in the midst of traffic some cars back from the intersection – which is not safe). It is a shame that we have a situation where people still need to ‘get off an walk’. More roads need to be designed for cyclists and pedestrians, as well as car users. just confirming – it is ok to passed traffic stopped at the lights in the left of the kerbside lane. Does this depend on whether there is a bike box or not? Always getting cars abusing me for pulling in front of them at red lights. It is legal to pass on the left of stopped traffic, whether there’s a bike lane or not, and whether there’s a bike box or not. You can’t cross the stop line, however. If there’s a bike box you can occupy that space.